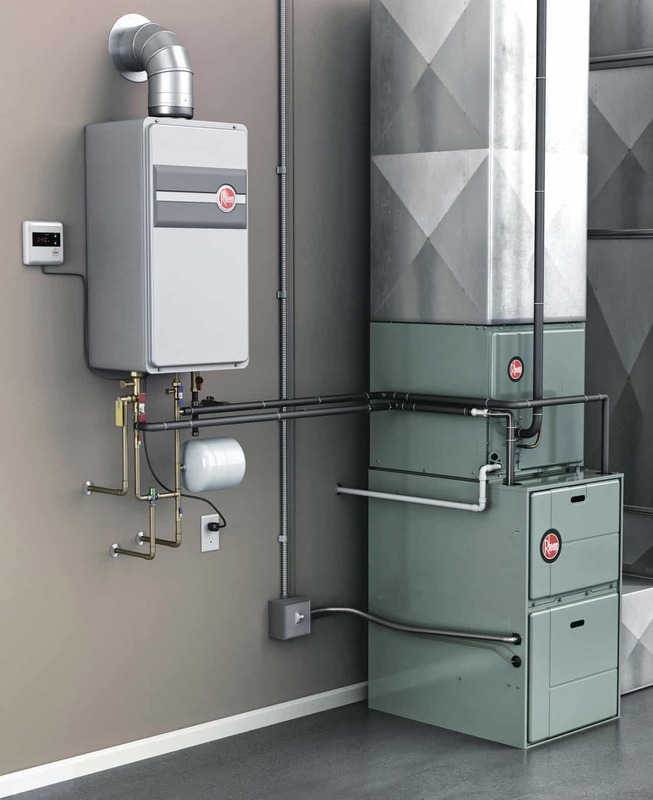 Rheem is one of the largest and most respected brands when it comes to tankless, on demand hot water heaters. Water heaters should last between 8 and 12 years, and they’re a pretty expensive purchase when the time comes to replace one. It’s important to do your research before you make such a big investment, so we’re here to help. In this article, we’ll take a look at some of top Rheem water heaters and break down the pros and cons of each model. 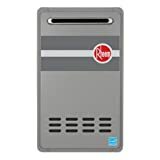 Rheem is a US-based company that was founded by two brothers, Richard and Donald, nearly 100 years ago in Emeryville CA. The company currently offers heating, cooling, water heating, pool/spa heating and commercial refrigeration products, and is the largest manufacturer of these items in North America. They have a long history of making high-quality water heaters and have received a number of industry awards for their work. They even sell tankless water heaters under two brands: Rheem and Eemax. Rheem’s top of the line model for consumers, the RTGH-95DVLN is a great product for any house replacing an indoor water heater. Homeowners with this model report that hot water flows instantly with almost no lag. With a flow rate of 9.5 gallons per minute, there’s almost no case where you’ll run out of hot water. It’s powered by cheap, clean-burning natural gas which makes it energy efficient. And it’s built using a stainless-steel condensing heat exchanger that is 94% energy efficient – you don’t waste time or money heating anything but water! Many homeowners even installed the unit themselves. For those who feel comfortable with this, we recommend purchasing the Rheem valve kit for this water heater to make installation even easier. And if you’re looking for help on the installation, have no fear. Amazon has an entire marketplace dedicated to finding a qualified plumber to handle the install at your home. The Rheem RTG-84XLN is similar to the RTGH-95DVLN in many ways. They’re both powered by natural gas. They’re both incredibly energy efficient. And they’re both constructed with the same high-quality materials and manufacturing standards that Rheem is known for. The main difference with this model is it is built for the outdoors. This makes it a great option for those who are replacing an outdoor heater or are trying to free up valuable space in their home or garage. This model does also have a lower flow rate of 8.4 gallons per minute, which is about 12% less than the indoor model. Still, the US government mandates that a shower head can have a maximum flow rate of 2.5 gallons per minute, which means this Rheem hot water heater should be more than enough for most homes. The Rheem RTEX-13 is an electric tankless water heater. Unlike the natural gas models above, this water heater has a digital thermostat that controls two copper heating elements that are used to heat water as it passes through the unit. The heating element is 99.8% efficient, which is pretty amazing. Installation is as simple as connecting the water lines and plugging the water heater in. However, electric water heaters do offer a slightly reduced flow rate. This model offers 3.17 gallons per minute, which is less than half of its natural gas-powered cousins. Even with the reduced flow rate, this should work well for most small to medium-sized homes. It’s a particularly good choice if you happen to have solar panels – using electricity instead of gas for your water heater will lower your monthly bills, meaning this water heater can pay for itself within the first few years.